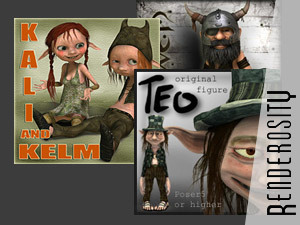 Forget about Turbosquid, Renderosity or the DAZ 3d models. Take a look a this collection of amazing free 3d ship models by Jed Swindels at Share CG: the Black Pearl, Flying Dutchman, Red Lion, Prince William and more. The only problem for Vue users: these models are in Bryce format. You will need to convert them in order to use them. Import in Vue and rework the textures one by one. If you apply a bitmap texture in parametric mapping mode, you will notice that you still have the UV coordinates, so you can normally map sails and so on.